Promote diuresis (especially for cases with difficult urination), clear Damp Heat in the Lower Warmer. Various urinary disorders with symptoms of frequent urination in small amounts (with or without blood in the urine), painful urination, urinary tract stones (including kidney stones), urinary tract infection or inflammation, pyelonephritis, gallstones. 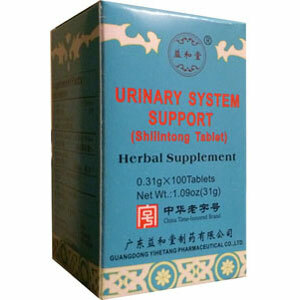 Shi Lin Tong is a popular and well-known herbal supplement that helps promote urinary tract health. Promote diuresis (especially for cases with difficult urination), clear Damp Heat in the Lower Warmer. Various urinary disorders with symptoms of frequent urination in small amounts (with or without blood in the urine), painful urination, urinary tract stones (including kidney stones), urinary tract infection or inflammation, pyelonephritis, gallstones, hepatitis with jaundice, cirrhosis or the liver with ascites, edema associated with nephritis. Take 5 tablets, 3 times a day.